I have a soft spot for Mr Kipling‘s exceedingly good cakes so I was delighted to see recently that they had an ad campaign on tv that conjured up all the nostalgia I had the for the brand. I love this advert. It looks like it was filmed in 1978, a time when I would have been at a children’s party just like this. These Mr Kipling Slices snap packs come in packs of 4. They’re great because you can both pop one in a lunchbox and it’s stays fresh and also because you don’t feel like you’ve opened the whole packet and have the remaining slices niggling away at you begging to be eaten. Whilst Britain goes caking mad, I think it’s entirely justified that Mr Kipling reclaim the crown as top boxed cake brand. Yes yes I know there’s nothing to beat home made cake but when it comes to caramel slices, I think I’d go for Mr Kipling above the effort required in the kitchen. My personal favourite is the Cherry Bakewell, the Mr K exceedingly good version far outweighing supermarket equivalents – what about you? This giveaway is currently set to run until 15th July 2012 however it may close early or be extended without notice. Read the rules below. Entries are verified so please no fibbing. Winners are announced on the Rafflecopter form after they have claimed their prizes. Want more chances to win? 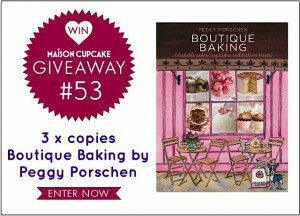 Bookmark https://maisoncupcake.com/giveaway and come back daily to register your bonus entries! 2. 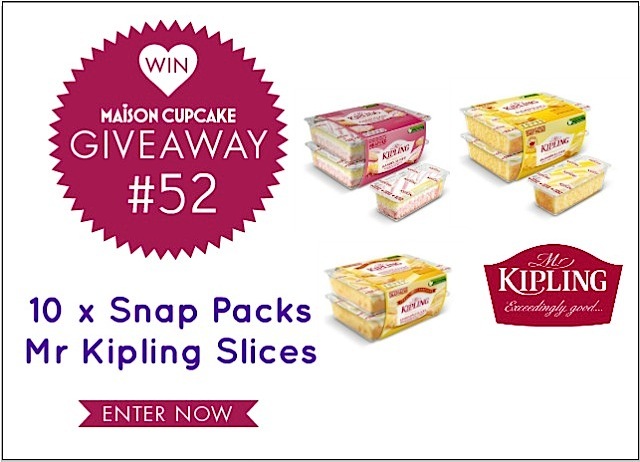 The prize is a selection of ten Mr Kipling snap packs in a mix of the varieties shown above. 5. This giveaway is hosted on behalf of prize sponsor Mr Kipling who will deliver the prize(s) following confirmation of winners’ contact details. return for bonus chances to win daily! A pink fondant fancy always gets my vote!!!!!!! Oh it has to be the cherry bakewell for me! That’s a really difficult qurstion. I like batterburg. But ask me to choose which is my favourite and you’d probably get a different answer every day, depending on mood. french fancies, the pink ones. The french fancies, but i also love the cake slices with the pink icing on them! My favourite is angel slices, is that what they’re called? The slices with sponge and then icing on top. Favorite is a very hard choice but I would have to go for cherry bakewell! Cherry bakewells, choc chip slices, battenburg – too many lovely scrummy choices!! It has to be a pink fondant fancy! I love Angel slices, they’re so gooey and lovely! It’s always Angel slices for me! Viennese Whirl is my fave. My favourite Mr Kipling cake has to be a Cherry Bakewell – you have to eat them around the edges first so that you save the cherry for your final bite, heavenly! I am most definitely an apple pie girl! Cherry Bakewells and Angel slices. To my shame, I have never tried any! Battenberg cake – an absolute classic, no doubt about it! Bakewell slices are my fave! Country Farmhouse slices – yummy! Bakewell Slices! If there are any left after my son knows they are in the cupboard!! Cherry Bakewells are my fave, though it is a hard choice! Pink French Fancy or a Vanessa Swirl! The Lemon Slice are so sharp & delicious! Cherry bakewells for me too. They seem very popular! You’ve gotta love mini battenburgs! Peel the marzipan off eat then eat the sponge colour by colour! Angel Slices – no question! Country slices are my favourite. Tough choice to make but I’d have to say my favourite is Battenberg – YUMMY! Battenberg – anything else as well tho 😉 Nom Nom Nom. Bakewell Tarts are the best. Cherry Bakewells are my fav. Chocolate chip cake for me – used to have it in my lunchbox as a child! I absolutely love Country slices… just cant get enough of them! I really really loved the Christmas pudding slices they were amazing!!! That’s a difficult question, I can’t choose one, I would have to narrow it down to; French Fancies (though I have to fight my children for these! ), Almond Slices (probably because I’m slightly nuts! ), and Cherry Bakewells (although I give the cherry to my Mum as I don’t like them.) Mr Kipling always brings back good memories of Sunday teatimes when my Grandma and Granddad used to come round too and we would be guaranteed Mr Kipling cakes. Mini battenbergs – better ratio of marzipan to cake in the small size! Battenburgs! They are my all time fave! I even love the mini’s for a little snack! got to be cherry bakewells! Angel slices have to be my favourite. Hmm. Fondant fancies and lemon slices. And battenberg. And viennese swirls. I love the Manor House cake – especially a slice in the afternoon with a steaming hot cup of coffee! My favourite is Battenburg – YUMMY!! Viennese Whirls are my favourite. It is a tough one as I LOVE Mr Kipling cakes…I think the Cherry Bakewell is a narrow winner followed by Country Slices which I love the spice in…delicious! Lemon slices. MMMMMmmmm. My mom makes a lemon cake and Mr Kipling cake taste as good as my mom’s!! got to be the trifle bakewells – sprinkles and all !!! Pink Fondant fancies always remind me of my Great Nan! I love French Fancies really lovely. gotta olove those french fancies. I bake alot but can’t beat Mr K’s FF’s mmmmmmm. Nothing beats a French Fancie! Another Cherry Bakewell fan here! Mini battenberg – yum, definitely my favourite! I lobe mini battenberg cakes. Bakewell slices! Best Cakes EVER! Bakewell slices cant get enough! I’m a big fan of their angel cake slices. I lurrrrrve the lemon slices! Angel cake all the way! Without a doubt cherry bakewells ! Mr Kipling cake now forms a large part of my genetic coding so I can confidently say Cherry Bakewell, or mini Battenburg, or Chocolate Slices or …..
Mr Kipling Manor House Cake is one of the few fruit cakes I enjoy, especially that slightly soft, sugary layer on top! I don’t have a favourite I love them all equally! I love cherry bakewells, and these are ideal for lunch boxes! Love them all, but especially cherry bakewells. French Fancies – especially the xmas ones yum! I just love Mr Kipling’s Cherry Bakewells !! The sweet, tangy Lemon Slices are divine! I’m a bit partial to the Lemon Slices! they are EXCEEEEEEEEEEEEEDDDDDDDDDDDIIIIIIIIIIIIINNNNNNNNNNNNGGGGGGGGGGGGGGGLLLLLLLLLLLYYY NICE CAKES!! Has to be the Lemon Slices for me.